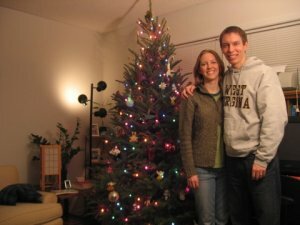 Happy Holidays from our happy little Carrboro home! We've had a good 2007 here, there, and everywhere. The year was off to a quiet start with the exception of Alex's 30th Birthday! In April, we joined Bill and Steph for the guys' B-Day celebration in Mexico. We were traveling again in June, spending a week in Oregon with Sara and Matt Cenal and friends. A couple of weeks later, we headed to Pueblo and Denver to visit with Carolyn and Brice and attend Servantstock - the 20th Anniversary of the Urban Servant Corps. The next week found us helping Susan and Thomas move to Hickory, NC. July was fairly calm, although we had to say goodbye to Anna as she headed off to Mali, West Africa, to serve in the Peace Corps. At the end of July, we spent a nice weekend in New York City with Jean and Brooks Leonard. September found us in Wilmington and at the beach to celebrate our first anniversary, and Emma spent a beautiful October weekend in Asheville with some close gal pals. We weren't worn out yet, though, and took the week of Thanksgiving off. 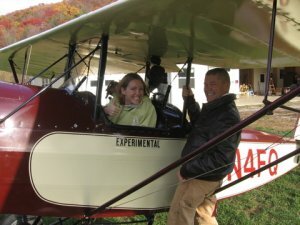 We stopped by Skip and Cinda Gadd's home in West Virginia and rode in the experimental Pietenpol airplane and then continued on to Troy, Missouri to spend the holiday with the Kunzas. We'll stick around NC in December, spending some time relaxing at the Creek. Alex continues to enjoy his job at iContact, which is growing by leaps and bounds. 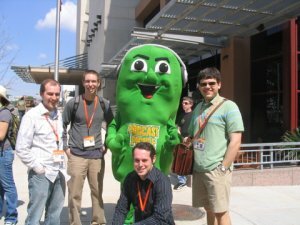 He also traveled to a few web conferences, once to Austin (South by Southwest) and twice to Boston (including during the World Series). Emma left her development job at UNC Wesley in August to gain more experience teaching sexual violence prevention programs. She continues working for FVRC and went through 50+ hours of training to volunteer with OCRCC. We really like living in Carrboro. We walk across the street to the farmer's market every weekend (when we're home!) and shop for organic and locally produced food at the Weaver Street Market co-op. 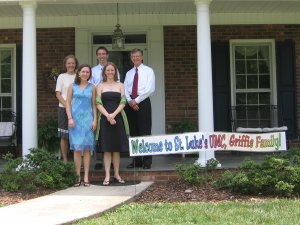 We cheered on the Tar Heels during March Madness and attended some fun theme parties with Anna and her roommates. We've been running and exercising as much as we can (minus the month of 95+ degree weather over the summer) and trying to save water during this severe drought. Alex recently bought some ice skates and is excited about taking some hockey classes next year, so we've been skating a few times to warm him up. It's been great to spend much of the year hanging out with family and friends; we can't wait to see what next year brings!